Moist cake loaded with almond flavor and a sweet, crunchy, crumbly top is guaranteed to make everyone in the house dash to the breakfast table. 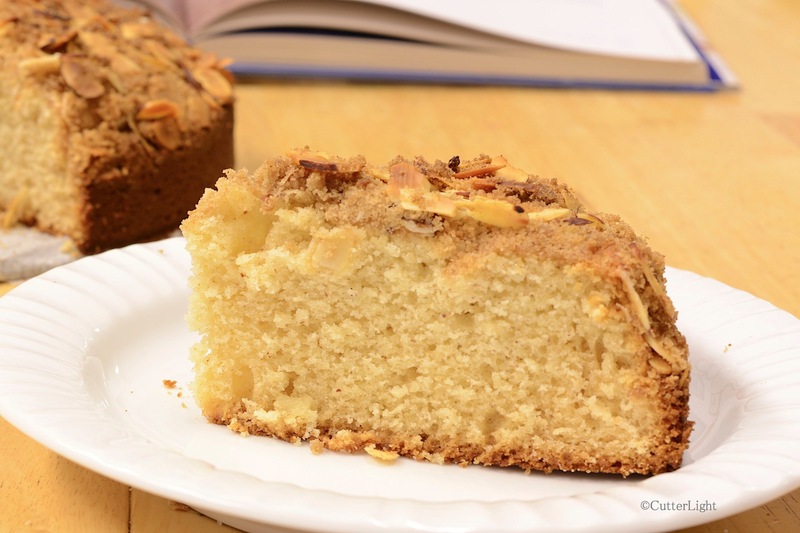 This cake is simple to make and delivers a triple dose of almond using almond paste, almond extract, and crunchy sliced almonds. So, you’ve finished eating all ten polar bear claws and your appetite for almond flavored breakfast pastries is still not sated. You dip your finger into the leftover half-can of almond paste and quickly realize that this product is not intended to be eaten straight. The solution? Almond breakfast crumb cake. The beauty of this cake is that it can be eaten anytime, but since it has breakfast in the title there is no guilt about eating a slice or two first thing in the morning with your coffee. Or drizzle it with a berry syrup for a scrumptious dessert. Grease a 9-inch springform pan. Set aside. Sift together flour, baking powder and salt in a medium bowl. In bowl of a stand mixer, combine butter and almond paste. Beat on medium speed until smooth. Add sugar and mix until blended. Add eggs, vanilla and almond extract and mix until blended. Add half of the flour mixture and milk. Mix until blended. Add remainder of flour mixture and mix just until blended. Sprinkle crumb topping evenly over top of batter. Bake until toothpick inserted into center comes out clean, about 50 minutes. Stir together first three ingredients. Add melted butter and stir mixture together until crumbly. Stir in almonds until mixed well. Well, I Did put eggs in it! This one was an instant favorite! Thanks for reading, Greg. And thanks for the reblog. Thanks for the reblog and thank for the compliment!